Burkina Faso protesters angry at plans to allow President Blaise Compaore to extend his 27-year-rule have set fire to parliament. Correspondents say the city hall and ruling party headquarters are also in flames. A huge crowd is surging towards the presidential palace and the main airport has been shut. Lawmakers have suspended a vote on changing the constitution to allow Balise Compaore to stand for re-election next year. Five people has been killed in the protests. The military had earlier fired live bullets at protesters who had stormed parliament. Dozens of soldiers have reportedly joined the protests, including a former defense minister, General Kouame Lougue. The main opposition leader, Zephirin Diabre, has called on the military to side with “the people”. Blaise Compaore’s whereabouts are unknown, but he has appealed for calm via Twitter. He first took power in a coup in 1987, and has won four disputed elections since then. The opposition has called for a campaign of civil disobedience to demand that Blaise Compaore steps down in elections next year. 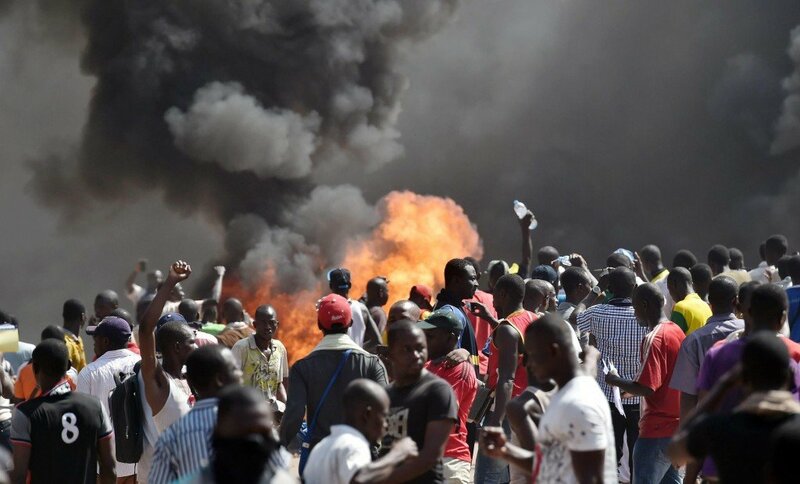 “October 30 is Burkina Faso’s Black Spring, like the Arab Spring,” opposition activist Emile Pargui Pare told AFP news agency. State television has gone off air after protesters stormed the building housing it and ransacked it, Reuters quotes a witness as saying. About 1,500 people breached the security cordon at parliament, AFP reports. Protesters were setting fire to documents and stealing computer equipment and cars outside the building were also set on fire, it reports. A massive crowd has also converged on the main square in Ouagadougou, and are marching towards the presidential palace, which is about 3 miles away. A government helicopter flying overhead was firing tear gas at them, Reuters reports. There are also reports of protests in the south-western city of Bobo Dioulasso. The government has been forced to suspend Thursday’s parliamentary vote on a constitutional amendment that would have lifted the limit on presidential terms so that Blaise Compaore could run for office again in 2015. It is not clear whether the government intends to hold the vote at a later stage, correspondents say. Blaise Compaore is a staunch ally of the US and France, which uses Burkina Faso as a base for military operations against militant Islamists in the Sahel region. Both France and the EU have called on Blaise Compaore to scrap the proposed constitutional amendment.